Can Chrome OS take the fight to more basic versions of Windows? Google has redesigned Chrome OS with a more traditional desktop-style appearance. But why has it done it? And is it any good? Here's everything you need to know. Chrome OS was originally released last year inside Chromebooks laptops from Samsung and Acer. They were essentially netbooks with a different operating system than Windows. But Chrome OS met with huge criticism – not least from this site - that it was too simplistic (the interface was just Google Chrome the browser with no desktop) and that it didn't really work when you weren't connected to the internet. Google simply hadn't done enough work on making its tools work when offline. This is now set to change though – read on for more. Chrome OS could finally be in a position to challenge more basic versions of Windows. The new Chrome OS is actually version 19 of the operating system – updates have been constantly dripping down to older Chromebooks – Google has created eight releases of the software since Chrome OS launched. 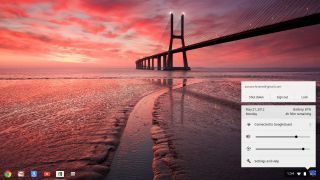 Chrome OS has been redesigned completely, with the "just a web browser" interface now complimented by a Windows 7-style desktop complete with Chrome icon instead of the Windows Start Menu orb. The apps display on the desktop also rather resembles Launchpad in Apple's Mac X Lion. Multitasking is now possible in multiple Chrome windows, but you can't pin apps to the desktop itself. You can, however, pin your most used apps to the task bar. Yep, just like in Windows 7. You can also flick Windows to view them side-by-side using the square box icon in the top right of the browser window. Here's Google on why Chrome OS needed Windows. Chrome OS uses the same apps you'd fine in the Chrome Web Store – the apps in Chrome still open in a Chrome browser window. That's because they are still web apps and aren't stored offline. However, this means that truly powerful apps are still beyond Chrome OS until cloud-based versions are built (while the amount of apps is also limited but growing), so you probably won't use a Chrome OS PC as your main machine. However, it could be a great hybrid solution for those of us who find a tablet too simplistic. There are two new Chrome OS PCs announced by Google – first up is the re-booted Samsung Series 5 Chromebook which features an Intel Atom processor , 16GB SSD, 4GB RAM and a completely revamped touchpad for £379 or $449 (£429 and $549 for the 3G versions). Yep, that's still pretty expensive - would you really plump for one over a full Windows PC? There's also the Chromebox, a small form-factor PC which we'd probably call a nettop. Again it's by Samsung. The big boon of Chrome OS is speed – it's quick and responsive because it's essentially based around Chrome the browser. Even though it looks like you're using a separate browser, all apps actually open in the browser window. The new OS also includes more GPU acceleration. "We're pretty happy with the progress of Chrome OS," Google's vice president of engineering Linus Upson told TechRadar. "The new generation of hardware is two or three times faster so that is also something we're pretty excited about." There's still a big question mark over how usable Chrome OS is with different files. However, Google is working on this and says the next version will use Google Drive as its cloud storage file system. However, file handling is better, and the system can now open all Office documents and can work online or offline. Google has also allowed copying to the local drive from USB flash drives in Chrome OS. The files now accessible include Office docs, PDF, ZIPs, RARs and movie and sound files. Google has been working hard to ensure that Chrome OS works a lot better offline. There is offline Google Mail while documents, music, photos and movies will also work offline in due course. The lack of offline Google Docs has been a massive problem, but Google promises this is imminent.